The Treaty of Ganghwa, also known in Japan as Korea-Japanese Treaty of Amity (Jp: 日朝修好条規 (Nicchō-shūkōjōki, 日朝修好条規), signed on February 27, 1876, was written by Kuroda Kiyotaka, Governor of Hokkaidō. Kuroda's intention was to open up Korea to Japanese trade. Japan sought to gain Korean's trust by allying with Korea to end Korea's status as a tributary state of China. The treaty describes Korea as an independent state, equal in status to Japan. However, the terms of the treaty were far from equal. The Treaty granted Japanese many rights that were not granted to Korea on an equal basis. The Treaty of Ganghwa was Korea's first formal step toward opening foreign relations after centuries of a strong policy of isolation. Ultimately, it later proved to be the first step towards Korea's submission to Japanese rule some three decades later. For a number of centuries, Korea had enjoyed a measure of security supported by its relationship of suzerainty with China. China controlled Korea from a distance, receiving annual payments of tribute in return for helping maintain Korean's safety, while control of the country essentially remained in Korea's hands. China did not, for example, station troops in Korea to keep an eye on things. The relationship consisted primarily of the annual tribute payments, and the Chinese court exerting its opinion on matters of state in a very civilized manner. After the Industrial Revolution in eighteenth century, European nations began to colonize many other weaker nations in Africa and Asia, in keeping with the political ideology called Imperialism. Almost all of Africa was colonized by European Powers; most of Central, South, and Southeast Asia including India was taken over by various European nations. East Asia also was invaded by foreign powers, beginning with the Opium Wars in China by Britain and other foreign powers; China's vast, magnificent empire was reduced to a half-colonized territory. Meanwhile, the American Asiatic Squadron under the leadership of Matthew C. Perry forced Japan to open its ports to the western world in 1854. Seeing how the western powers were gaining control of China, and not wishing to be taken under control by the western powers, Korea decided to sign a treaty with Japan, feeling that Japan would be a safer partner than the Europeans or the Americans. However, at the same time, humiliated by unequal treaties signed with European nations and shamed by their failure to resist Admiral Perry's inroads, Japan responded by embarking on a rapid transformation, successfully turning itself from a comparatively medieval society into a modern industrialized state in a short period of time. 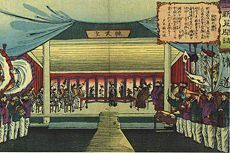 Japan's next step was to imitate the techniques that the western powers had used in relation to her, and exert the same kind of control over Korea, beginning with the Treaty of Ganghwa. In the late Joseon period in Korea, Daewongun maintained a strong closed door policy to European powers. During the period when Daewongun held power, France and United States had made several unsuccessful attempts to begin commerce with the Joseon Dynasty. When Gojong and Queen Min took over rule of the Joseon nation from Daewongun, advisors in the court felt it was time to open the country to relations with the outside world. While there was political instability, Japan developed a plan to open and exert influence on Korea before a European power could. 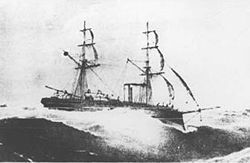 In 1875, their plan was put into action: the Unyo, a small Japanese warship under the command of Inoue Yoshika, was dispatched to survey coastal waters without Korean permission. The landing of the forces of the Unyo at Ganghwa Island in 1875. On September 20, the ship reached Ganghwa Island, which had been a site of violent confrontations between Korean forces and foreign forces in the previous decade. In 1866, the island was briefly occupied by the French, and also in 1871 subject to American intervention. The memories of those confrontations were very fresh, and there was little question that the Korean garrison would shoot at any approaching foreign ship. Nonetheless, Commander Inoue ordered a small boat launched—allegedly in search of drinkable water. The Korean forts opened fire. The Unyo brought its superior firepower to bear and silenced the Korean guns. Then it attacked another Korean port and withdrew back to Japan. The Imperial Japanese Navy, in Pusan, on its way to Ganghwa Island (江華島), Korea, January 16, 1876. There were 2 warships (Nisshin, Moshun), 3 troop transports, and one liner for the embassy led by Kuroda Kiyotaka. 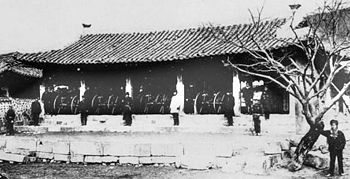 Four Gatling guns set up in Ganghwa by Japanese troops. 1876 Kuroda mission. The following year saw a Japanese fleet led by Special Envoy Kuroda Kiyotaka coming over to Korea, demanding an apology from Joseon government and demanded that Korea sign the Treaty of Ganghwa, a treaty of commerce between the two nations. The Korean government decided to accept the demand, in hope of importing some technologies to defend the country from the any future invasions of European powers. The treaty became the first unequal treaty signed by Korea; it gave extraterritorial rights to Japanese citizens in Korea, the Korean government was to open 3 ports to Japanese and foreign trade, specifically Busan, Incheon and Wonsan and was to establish its independence in foreign relations from China (although it still paid tribute to China). Following the signing of the Treaty of Ganghwa, between Japan and Korea, China was worried that Japan would gain too much control over Korea, so China encouraged Korea to sign similar treaties with the United States (1882), Great Britain (1883), Germany (1883), Italy (1884), France (1886), Austria-Hungary (1892), Belgium (1901), and Denmark (1902). A little while later, Japan demanded Korea sign a treaty turning over control of Korea's communications to Japan (1905), and later the same year, another treaty put control of Korea's foreign relations under Japanese control. In 1907, the Japanese demanded that Emperor Gojong step down from the throne in favor of his son, Sunjong. Finally, in 1910, Korea signed contract of Annexation by Japan, and Japan declared that the Korean Empire was dissolved and that Korea was under Japanese rule. McDougall, Walter A. 1993. Let the sea make a noise—: a history of the North Pacific from Magellan to MacArthur. New York, NY: Basic Books. ISBN 978-0465051526. History of "Treaty of Ganghwa"
This page was last modified on 15 December 2015, at 22:59.